As Britain has to endure the scandal that many of its impoverished citizens are having to turn to food banks to find a meal the time has come to develop community horticulture. Post-war Britain was an optimistic period. We had won the war- with much help- and were bent on creating a welfare state in which people were protected from cradle to grave. We still have the National Health Service, but in the last few years there has been an explosion of food poverty. As benefit cuts, imposed after the banking crisis, bite, many people cannot afford a meal. Food banks, such as the Trussel Trust, are proliferating. Often they are run by churches. Despite their efforts, we are merely staving off the worst. Britain needs a renewed effort to produce food on its own and put this production into the hands of ordinary people. Let me get this clear. No one has yet died of starvation because of government cuts, but many people go hungry and underfed. Due to the effects of the economic crisis of the last few years, Britain's reasonably generous welfare system has come under immense strain, and cuts were necessary, as they have been in all areas. However, denying that cuts cause problems is the province of politicians who feel embarrassed by the results of their policies. The Conservative government minister who claimed that people who use food banks are just after a free meal is not to be taken seriously. Between April and September 2013, 355,985 people, including 120,000 children, received food parcels as they could not afford to buy food. This number is vastly increased since 2012. The Red Cross is now planning to distribute food parcels to the needy, the first time since the Second World War that it has done so. But even more problematic now is that some people are returning food that needs to be heated, as they cannot afford to switch on their electricity to heat it. but I must emphasise that this is not a widespread problem, as it concerns the socially deprived stratum of society, but once we had a net strong enough to care for these people, and now that net is failing. The problem is worsening, and the Prime Minister, basically a decent well meaning person, does not know what to do about it, and the problem is growing. I am under no illusion that this is a uniquely British problem, and that there will be other places where this sort of trouble occurs, but once we did not have it. Now we do. New problems require new solutions, or perhaps the resurrection of old ones. They also require a change to social organisation to deal with them. The old solution that I would like to renew is a return to the wartime principle of dig for victory, but now it would be dig against poverty. The idea that social problems can be solved by handouts is as much a delusion as the belief that handouts do no good. They see people through a hard patch, but there is no substitute for employment at a fair wage. But that is not the remit of this article, I am more concerned with how to remedy food poverty for the badly paid, unemployed and under-employed. What strikes me is that Britain is an agriculturally productive place. Its soils are good and its climate benign. What is to stop its people growing much of their own basic food needs? In war time our forebears made a monumental effort to grow the nation's needs, and thus they endured the Nazi blockade. What is to prevent this happening again. This raises the issue that there is much land wasted. I am not speaking or urban leisure land, such as parks, that do great work as the lungs of the cities, or even sports grounds and race courses, but some, I know not how many, farms have become rich people's toys, land kept for leisure. Just as in wartime, the government took emergency powers to force people to use their land wisely, so nowadays, as the food crisis grows, why cannot the government take powers to ensure that every farm is properly utilised. This is not to discredit British farmers, as they farm in a very efficient way, but it is to point out that underused land is socially irresponsible. There is nothing illiberal in demanding that it be used properly.Hunger is always an emergency. We need a national audit of land to see how much is not being used well. Food security in one country is part of a growing problem across the world,as pressures on food supplies grow ever greater. Britain, for a long time an importer of food, must increase its efforts to produxe more domestically grown food than it already is doing. Farmers are doing their best, but we need more peope to use their gardens productively. Yet farms alone will not be the only answer. What better than to empower people to feed themselves? Here is where my scheme differs from conventional socialism. Put simply,my economics is the economics of Elwin Schumacher, the writer of the iconic book Small is Beautiful. Schumacher rejected the massive state, which he saw as repressive, but he also rejected the minimal state of the philosophies of the right. He believed in empowering local communities to solve their own problems, and unlike tradtional socialists he supported individual efforts at taking personal responsiibility. Schumacher believed in civil society and the localized state. Civil society is intermediate between the state and the individual. It is voluntary association under the power of local people rather than under bureaucrats. Schumacher gave us social responsibility with liberty. 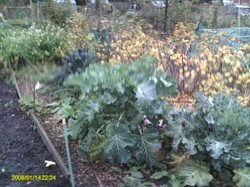 We need community growing schemes. In Cuba they have the hydroponicos, community gardens in which the people of the towns grow their own food, which could be a model for other societies. There could be problems in finding land, but there are parcels of land still available that could be used. Already I have donated some spare onion sets to a community land project in a deprived part of Manchester that is to be run by local women. It will enable them to grow food for their families. We should never underestimate the strength of women's networks. The social bonds that they forge are immensely powerful and productive. Community allotments need to be developed across Britain, and I suggest that the scheme might spread across other advanced societies. We need to keep them out of the hands of the bureaucrats, who love control, and developers, who want to profit from the land. Thankfully schools are now teaching chiilden to grow their own food. It is a far cry from my schooling, because I was not allowed to take gardening because I was in the top class. Only the intelellectually weak boys [no girls] did Rural Studies. I used to look longingly at their greenhouse and the lovely vegetable beds. The Education system has much to answer for. Hugh Fearnly Whittingstall, head of the successful River Cottage enterprise, has pushed the idea of landshare, in which people find parcels of land which are then developed into community growing schemes. Hugh has had great success in his enterprise and is doing much for food security in Britain. frankbeswick, This World War II slogan has so much simple, straightforward truth: "It's difficult to think anything but pleasant thoughts while eating a home-grown tomato." Gardening of any kind, including window gardens, is a worthy endeavor. There truly is nothing so tasty as a fruit or vegetable freshly picked from the garden. Thank you for sharing the positive topic of self-sufficiency via Victory-style gardening on Cyberland. Yes, the joy of a back garden is that you have more freedom than I do on my allotment. I am not allowed chickens or any livestock. At home I have a yard, so I am limited in what I can do. I'm old enough to remember lots of people having backyard gardens, whether they were large or small. Times are bringing us reasons to get back to home gardening and local food production, IMO a good thing! You have hit the nail on the head. Currently the storage facilities at the food banks are not good enough. I accept what you say about your not being emergency, and I was probably weak in the way that I expressed myself. You are right in saying that there is no wrong on giving and receiving charity. Yes I did note you did not disapprove of handouts. What I wanted to make clear was that our situation was not "emergency". We were poor. It was our daily life. No small wonder that most of my brothers dropped out of school and enlisted in the military. They would get meals and a place to sleep, and my mother wouldn't have to struggle to take care of them. Also, with respect to the fresh food. It's great you volunteered. But it's hard to keep fresh food fresh. Perhaps the banks don't have the needed equipment for storage. Maybe a philanthropist or humanitarian will read this article and think about donating food storage equipment. There is a solution. I'm certain of that. But it's probably being hindered by selfish humans. This is the real sad part. Those ordinary humans are probably gov't folks who ain't starving. Just sayin'. Just throwing it out there. Call it an opinionated observation based on history repeating itself in various other countries who pretty much have or had the same problem. I agree.It is not a pretty picture. Britain is run by a coalition led by the Conservatives. Their Liberal Democrat partners are the minority, and so cannot do much other than to neutralize the worst efforts of the Conservative right, though some good has been done by them. Labour talks the talk but has not done anything about the rampaging of capitalism for many years. Blair was a natural ally of all people in power and he betrayed Labour's tradition of state management of the economy, though his attitude to the liberties of the Brtiish people was frigthening and we are best rid of him. You note that I did not oppose handouts, but implied that they are an emergency measure and are no substitute for just wages. I am slightly saddened by the fact that I volunteered food from my allotment to the food bank, but they are not ready to take fresh food yet. they take canned and packeted foodstuffs. What a wonderful world! Ordinary people are left alone to live an ordinary life in peace amongst each other. Oh wait! I was dreaming. Your article just slapped me and woke me up!! It is true that social problems can't be corrected by handouts. But I was a welfare recipient when I was a child and I was thankful I lived in a country that gave away cheese and other foodstuffs. Still ... my momma and daddy raised me to learn how to take care of myself. They always reminded wasn't nothing wrong with receiving charity and giving it. I would have expected better of Britain though. The picture you paint is not pretty.